Its the best time of the year! Certainly not coz of the climate but because of the plethora of gorgeous vibrant flowers and the variety of greens available for my kitchen! Winter greens are healthy, nutritious and so versatile. One could do so much with it. Innovate & cook. Any kind of condiment with my food is an indispensable part of our meals. A spicy dip or a kachumbar salad enhances the flavors. A lot of time even a homemade ghee is handy! 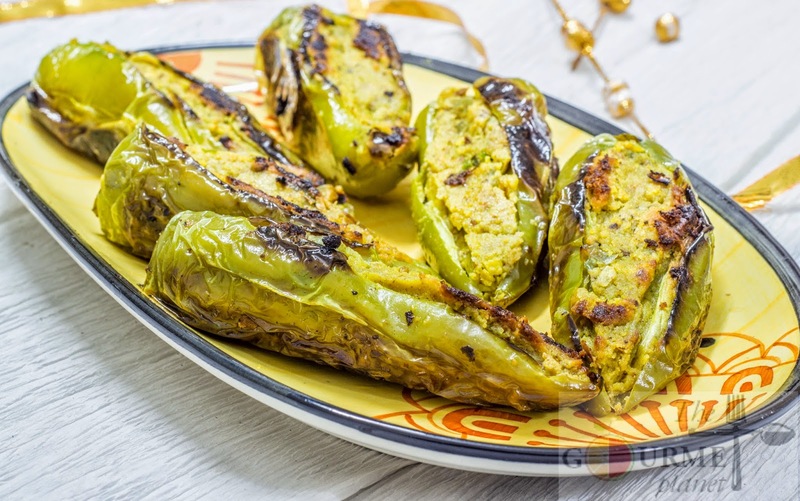 Winter season is a season of pickles, chutneys and green chillies with spicy stuffing! Takes a simple meal to a different dimension all together. While i was doing my weekly grocery and vegetable shopping, i caught hold of some bhavanagri hari mirch/green jalapenos which are so multifaceted. Stuff them with mashed potatoes or spicy keema mixture and deep fry them, they make an awesome delectable finger food. 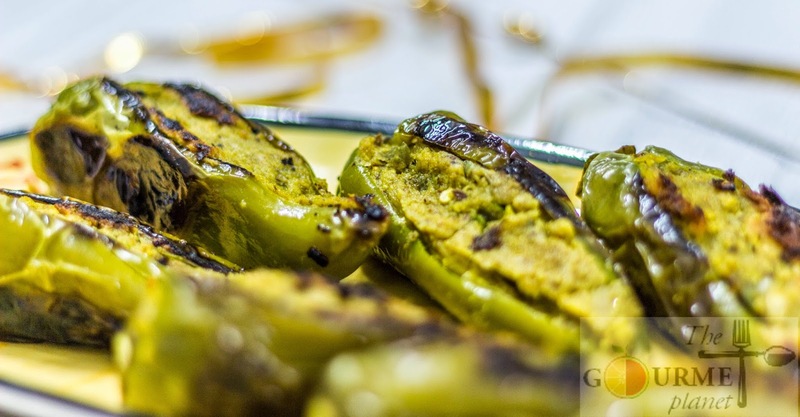 Cut them in chunks and spice them, makes a perfect pickle accompaniment for your one pot meals or just stuff them with roasted gram flour and you will get a perfect match for your parathans. A not so fiery yet delectable combination of green chillies and spices make this a right accompaniment, which stands out for its simplicity and intrinsic flavor. The recipe uses simple spices which are handy at home. Store them in an airtight container and put them in the fridge to be consumed later. I am sure you are going to love this spicy treat as its very very easy. NOTE: Do not throw the seeds away. They will be used for stuffing. 2. Heat oil in a wok and throw in the spices in 'Roughly pound in mortar & pestle' and saute. 3. Now one by one add the items mentioned under 'Tempering' , grated ginger and the seeds scooped out from jalapenos. 4. Add salt, turmeric and amchoor powder. 5. Now add besan and vigorously saute till the besan becomes fragrant. 6. Add water slowly and keep stirring so that no lumps are formed. 7. The besan mix should not be lumpy but smooth and should be dough like . 8. Let the mixture cool and later fill the slit jalapenos with this mix with soft hands else you will end up breaking the jalapenos. 9. Once all the jalapenos have been filled, pan roast them in a broad pan until cooked from each side. NOTE: Use 2 tsp oil for pan frying and keep the flame low. You will need to keep a constant watch else they would burn. The jalapenos would be ready in 10-15 mins.